Dark Water Training is a new scuba dive shop in St. John's, Newfoundland started by a group of diving buddies who have many years of combined experience diving the cold waters of Atlantic Canada. With a shared love of cold water diving, exploring the many shipwrecks and natural wonder of Newfoundland's marine life, these friends have come together to offer tank fills & tank maintenance to other diving enthusiasts in the area. 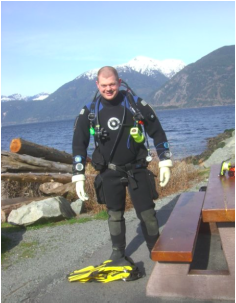 I am an avid cold water scuba diver that makes his home in Newfoundland, Canada. I am firstly a mentor, and want to help people to become cold water divers, as there is so much to see in the water beyond the tropics. However, it does require a lot of patience and hard work to learn in comparison to warm water diving, because of the extra planning, exposure protection, gear, and skills involved. I am also an recreational scuba instructor that can train students from open water scuba diver up to assistant instructor. My day job is Marine Biology, and I spend a lot of my time in the water passively doing that job by looking for a whole manner of critters. I spend most of my time trying to understand why they act and react in they ways they do. So when I dive I spend a lot of time going very slowly while I watch the underwater critters do their thing.